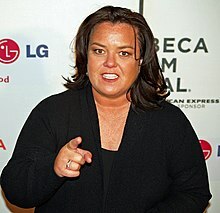 Roseann "Rosie" O'Donnell (born March 21, 1962) is an American television host, comedienne, actress, and author. She gained exposure by appearing on Star Search, a talent show. Her daytime talk show, The Rosie O'Donnell Show, began in 1996 and ran until 2002. She briefly hosted a primetime talk show on the Oprah Winfrey Network called The Rosie Show from 2011 until 2012. O'Donnell won an Emmy Award in 1999. She is openly lesbian and has been married twice. She has adopted five children. O'Donnell was the host of the panel talk show The View on ABC from 2006 until 2007, when she was replaced by Whoopi Goldberg. She returned to The View in 2014 for a few months. In August 2012, O'Donnell suffered a heart attack. She hosted a stand-up comedy event that aired on HBO for Valentine's Day in 2015, called Rosie O'Donnell: A Heartfelt Standup. In the documentary, she detailed her life since her heart attack. She has appeared on the Showtime series Smilf as the character Tutu since 2017. In October 2018, she became engaged to Boston police officer Elizabeth Rooney. They dated for a year beforehand. ↑ Doheny, Kathleen. "Rosie O'Donnell's Heart Attack: Know Your Symptoms". WebMD. Retrieved 2019-04-11. ↑ "Rosie O'Donnell: A Heartfelt Stand Up". HBO. Retrieved 2019-04-19. ↑ "SMILF: Seasons, Episodes, Cast, Characters - Official Series Site | SHOWTIME". SHO.com. Retrieved 2019-04-11. ↑ Taylor, Derrick Bryson; Bacardi, Francesca (2018-10-23). "Rosie O'Donnell engaged to police officer Elizabeth Rooney". Page Six. Retrieved 2019-04-11. ↑ "Rosie O'Donnell Dating Woman Who Is 22 Years Her Junior". Closer Weekly. 2017-11-08. Retrieved 2019-04-19. This page was last changed on 19 April 2019, at 22:02.